Posted on March 05, 2012 at 4:50:02 am by Kayleen R.
Most people in Fort Wayne cannot remember a time before Komet Hockey was present in the Summit City. The team’s origin began in 1952 when the Allen County War Memorial Coliseum offered a location large enough to contain crowds. In the beginning, the Komet Hockey team was affiliated with the International Hockey League. Since then, they have also been members of the United Hockey League. The name ‘Komet’ was created by the team’s first general manager, Ernie Berg. He liked the idea of something that was speedy and exciting like a Comet to refer to the new team. His wife’s name of Kay clinched the initial letter of the new team’s moniker with the letter ‘K’. 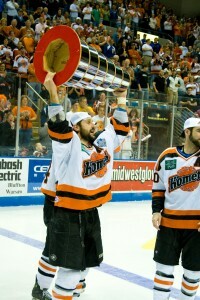 Over the past six decades the Komets’ aggressive playing style and talent have earned the team 12 regular season championships (9 IHL, 3 UHL), 12 Division Titles (8 IHL and 4 UHL) and eight championship titles (7 IHL Turner Cups, 1 UHL Colonial Cup). Komet fans have supported their team throughout the years with many sell-out nights. And of course, the Komets’ history would not be complete without mention of long-time, beloved announcer Bob Chase and sassy mascot, Icy the Eagle. This strong combination of loyal fans, talented players, experienced announcers and fun-to-watch mascot have contributed to a strong hockey interest in Fort Wayne that is sure to continue for 60 more years. Join the Komets in their upcoming home stands on March 9-10, March 16-17, and March 21-23!